As it has been a holiday weekend, I am distanced from my lovely desktop and all of the content contained therein. I am thus at the mercy of whatever is available on my laptop. All this is to say that this post will be delightfully short. The photo below was taken from Treasure Island. Treasure Island is a small manmade island that connects to the two halves of the Bay Bridge. I think I prefer the sky on the shorter exposure, and the smooth water on the longer one. I understand that there is a way to combine both worlds through photoshop or some such. I have yet to delve much into photoshop, so this melding of the worlds will have to wait for another day. I have been sitting onto this post for awhile, because there’s another angle on this shot that I had hoped to capture before posting. One of my hobbies is haunting forums and whatnot looking for interesting local places to photograph. 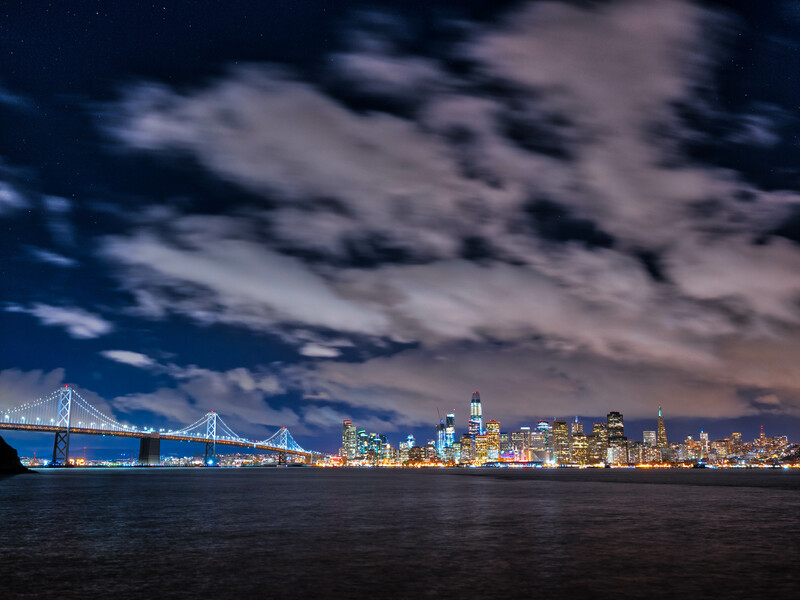 Recently I came across this pretty rad shot in one such forum, wherein the photographer had captured the San Francisco skyline by shooting under the Bay Bridge towards the city. I wants this picture. I NEEDS this picture! I cannot figure out how to take this picture…yet. As it stands, I have engaged in several reconnaissance missions to try to track the mysterious location down. I’m pretty sure it was taken from Treasure Island’s sister island, Yerba Buena Island. Much of Yerba Buena Island is Coast Guard property. It kind of looks like the only way to get at the location in question is to trespass. Obviously, I’m not super keen to trespass on government property. Then again, it’s a pretty spectacular angle on the skyline. What to do? I have been giving some thought to contacting the Coast Guard through their unofficial Facebook page and feeling them out on the subject. Never let it be said, dear readers, that I don’t make every effort on your behalves. If I am ultimately successful, you’ll be the first to know. Or maybe the photographer works for the Coast Guard?